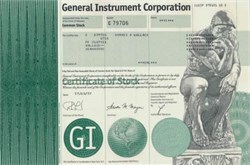 Beautifully engraved certificate from the General Instrument Corporation issued in 1997. This historic document was printed by the American Banknote Company and has an underprint of "The Thinker". This item has the printed signatures of the Company's Chairman of the Board and Secretary. General Instrument Corporation was the leading provider of integrated and interactive broadband access solutions, teaming with its business partners to lead the convergence of the Internet, telecommunications and video entertainment industries.